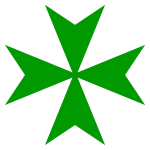 The Hospitaller Order of Saint Lazarus of Jerusalem was a medieval military, religious and Hospitaller Order of Chivalry, and bore no resemblance to modern-day historical or charitable organizations, all using the name Saint Lazarus. It was military in that it played a military role from 1120 to about the beginning of the 16th century. Until 1291, its military activities were centered in the Holy Land helping to hold it for Christianity, while after its loss they were involved in the protection of the pilgrim routes, particularly of that to Santiago de Compostela. The military role was partly revived in the early 17th century when the Order maintained a squadron of ten frigates based at St Malo, manned by the knights, novices and chaplains. With the ending of the Order’s naval activities in 1668, the military role was continued by means of its naval academy, and the ownership of a military school in Paris, which it held until the French Revolution in 1791. With regards to the religious aspect, the Order was originally an order of monks taking the triple vows of poverty, chastity and obedience. The monastic character was in no way lessened when it commenced its military role. After the Crusading period, the Order’s religious character was maintained by means of its chaplains, its Religious Protector, its Spiritual Grand Prior, its rules, services and traditions. Members were expected to live their lives in the spirit of ecumenical Christian charity. The Order was Hospitaller in that its origins allegedly stem from a leper hospice founded in Jerusalem in the 4th or 5th century. The Order, according to some historians, was first established during the time of Saint Basil, with the founding of its first hospital in the city of Ptolemais (Acre). Other authors state that the source of the name of the Order stems from the fact that the Order was started by a group of Armenian monks who worked under the Rule of Saint Basil, and that their work was primarily to look after lepers. Due to this very contagious work, these monks were given quarters outside the walls of Jerusalem and their ‘hospice’ was established near to the Gate of Saint Lazarus, or, as it was referred to, the postern of Saint Lazarus. It is thus due to this geographical location that they became known as the Order of Saint Lazarus. Apart from this knightly aspect of chivalry, it also implied that privilege went hand in hand with responsibility, to care for the sick and protect the weak. It was service without being servile, the use of one’s effort and strength for the purpose of Christian and human charity. The Order was not a reward, but a commitment of service past, present and future, to carry out its aims, and to work for humanity in its name. Through the dedication of its knights and members, its nobility of purpose in caring for the sick, and its splendid history, the Order’s traditions have survived intact throughout the centuries, and should continue so for centuries to come, as long as Christianity, and a need to help our fellow man, exists. The establishment of a Supreme Grand Priory to govern all the united Grand Priories within the Hospitaller Order of Saint Lazarus with proper and statutory representation for all Grand Priories. The establishment of the Supreme Grand Prior, duly elected by the Grand Officers of the Supreme Grand Priories to preside on the work carried out by the Supreme Grand Priory. The role of the Supreme Grand Prior thus takes the form of an experienced Chairman to the operation and has nothing whatsoever to do with the various uncalled-for trappings and hyperbolic add-ons which are normally found in other organizations which use the title of Grand Master or Master General. The unanimous agreement within the United Grand Priories that all funds generated from specific regions by the various Saint Lazarus Commanderies, Grand Commanderies and Grand Priories will remain available to be utilized in charitable and Hospitaller works in the region from where they were collected. From 2007 onwards, the Hospitaller Order of Saint Lazarus of Jerusalem expanded greatly in various countries and regions. The Order established itself in 41 different regions with 49 independent jurisdictions (as of July 2012) in the continents of North and South America, Europe, Asia, Australia/Oceania and Africa. While most of its jurisdictions are organized as Grand Priories, there are a number of jurisdictions which are somewhat smaller in number and thus are organized as Grand Commanderies, Commanderies and Delegations. In 2009, the United Grand Priories entered into a synergic, collaboration agreement with the Union Corps San Lazare International, based in Vienna, Austria. The latter are a registered nongovernmental organization also spread around the world with an impressive amount of Hospitaller work world wide to their credit. In 2011, the international operations of the Saint Lazarus Corps – Special Rescue Group also entered into a strategic alliance with the United Grand Priories of the Hospitaller Order of Saint Lazarus of Jerusalem and is indeed operating from within the offices of the Grand Chancellery of the Order. By 2012, both these Lazarite organisations worldwide had officially joined the United Grand Priories of the Hospitaller Order of Saint Lazarus and both chivalric organisations have voting rights within the Supreme Grand Priory of the Order in much the same manner as other Grand Priories of the Order have this right of vote. The year 2012 also saw the Sacred Medical Order of the Knights of Hope unanimously voting to join the United Grand Priories of the Order during the International Lazarite Symposium held in April in the ancient Sacra Infermeria of the Knights of Saint John. The Sacred Medical Order of the Knights of Hope is registered in Equador and works world-wide in direct, hands-on medical and Hospitaller work with the needy. The Order’s international presence and activities were also noted within several international structures. The United Grand Priories of the Hospitaller Order of Saint Lazarus was accepted and listed as a Non-Governmental Organisation within the United Nations and is also an active member of several international and European fora, including organisations working with the Council of Europe.